When we are truly in our right work, there is a powerful and passionate rhythm to our work. We are in synchronicity with the most basic and personal beat that comes from our hearts. Barbara Borden is a woman and world class professional drummer, and definitely, in her right work! Right work is when our strongest talents, skills and abilities, our core values as people, and our current top priorities relative to life, are aligned with the work we do. In my book Finding Right Work: Five Steps to a Life You Love, I describe the process more fully. I did not know who Barbara really was, where she had come from, or what passion and tenacity had led to her career. How did she become a world class drummer? How did she earn a living in music? Barbara’s early history is remarkable in how much support she did receive to pursue her love for drums. Barbara gratefully points to her family. Her father left the family early on, leaving her mother, Barbara, and her twin sisters, to survive alone. Survive they did! In fact, they thrived! Barbara’s career was not without setbacks. Barbara had found a gig in a San Francisco club that let her drum every night with a salary that enabled her to get by financially. After six weeks of hard work, the club went bankrupt, and neither Barbara nor her fellow band members got paid. For Barbara, this was “proof positive” that —few people (and certainly no woman) can make a real living working as a professional drummer. She stopped playing for six years. Barbara got a “real job” as a lab technician, married, and divorced. She does not look on this time with any bitterness, but, instead, sees it as a time she got to experiment with those things she thought she had been missing in life, by focusing so heavily on drumming. But when a friend’s mother heard Barbara for the first time, drumming at home one night, she told Barbara that she had to go back to drumming. Barbara has never looked back. Yes!, Barbara recalls, as do many people who search for the right work. The initial financial terror that comes from “jumping of the cliff” into financial uncertainty is daunting. She took a job as a bookkeeper part-time to dual track while discovering what her next right work was. Her vision was clear, but economically, things were precarious. And then, miraculously, it all came together with the inception of Barbara’s dream band, Alive. Alive had world-class talent, became financially viable, and was an all women jazz quintet. Alive was an extraordinary achievement. It was an all-woman jazz band with its five members who were not only outstanding musicians, but, also, brought a unique wisdom and understanding to the group. “We had a full time therapist, to keep the band running smoothly,” Barbara says. It worked. The band was wildly successful. This was Barbara’s dream come true. Life is change, and so are priorities relative to work. After eight years Alive broke up. Barbara was devastated. She says, it took the next fifteen years of her life to recover. 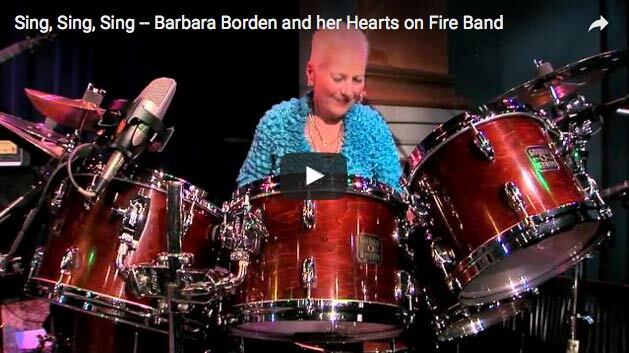 Barbara’s passion and commitment for music and drumming only deepened. She traveled around the globe, often bringing her drumming to distant and sometimes war-torn parts of the world. Barbara wrote music, recorded CD’s, taught classes, and engaged more and more in a passion and a talent she simply could not leave behind. Over time, Barbara worked in new bands, co-created a sole “percussion play” called She Dares to Drum with actor/director Naomi Newman, and integrated her writing, performance and teaching into a vibrant tapestry of successful and popular work. Over time, Barbara had begun playing large ceremonial drums. One day, someone put his hand under her drum. The experience for him proved to be one of a soothing feeling and sense of well-being. Many people wanted to try the new experience. I asked Barbara what advice she could give to the rest of us who did not necessarily have the deep artistic talent Barbara has displayed throughout her work career. This was a question that Barbara understood very well. 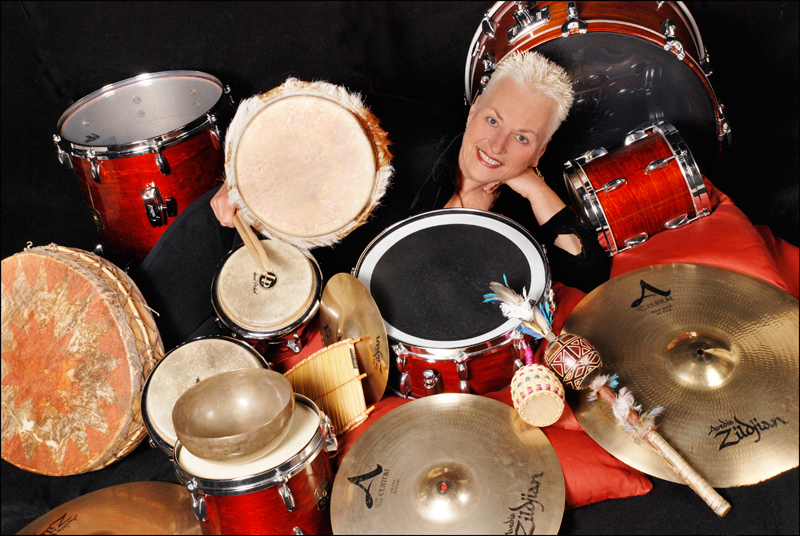 Keeper of the Beat : A Woman’s Journey into the Heart of Drumming is an hour-long documentary in which Barbara Borden, an acclaimed drummer, composer and teacher tells her story in eloquent words and toe-tapping music. It showcases the unfolding of Barbara’s identity as she grows from a little girl in love with drumming to a world-class percussionist practicing drumbeat diplomacy.” Filmed on four continents, the film is produced and directed by three-time Emmy Award-winner, David L. Brown.